Synthetic Fuels Production | AIR TECHNIC s.r.o. From 2016 AIR TECHNIC co-operates with EXPANDER ENERGY INC due to the use of biomass gasification technology (system AIR TECHNIC) for the production of synthetic fuels – Biomass Gas to Liquids (BGTL). Expander Energy INC (www.expanderenergy.com) is a technology company providing innovative solutions for the environmental and economic production of Synthetic Fuels. Expander Energy fosters a culture of innovation through which create and develop new methods of carbon management, providing sustainability, environmental accountability, and the most advantageous path forward. Mission of Expander Energy is to revolutionize the fuels of today providing a bridge to the fuels of the future. 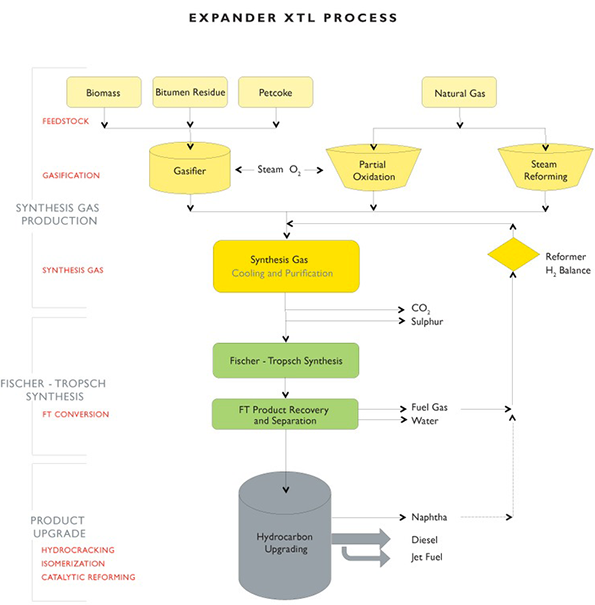 Expander has developed a range of new technologies centered on the use and application of F-T principles, a collection of chemical reactions that convert a mixture of carbon monoxide and hydrogen, called synthesis or syngas, into a liquid hydrocarbon such as synthetic diesel and jet fuel. Its major innovation was to prioritize the conservation of carbon in its process design. Rather than lose potentially valuable carbon through a process conceived through an old paradigm, our process recycles the less valuable outputs (e.g. alcohols, naphtha, wax, etc.) to create the ideal 2:1 hydrogen carbon monoxide feedstock for the Fischer-Tropsch reaction. As a result, our EFT® process significantly reduces carbon emissions and dramatically increases targeted output. Expander’s innovative energy technology is based on the proven Fischer-Tropsch (F-T) process, in conjunction with its Enhanced Fischer-Tropsch® (EFT®) process to manufacture next generation synthetic fuels; SynDiesel® and SynJet™ . The EFT® process converts high carbon sources of feedstock, such as natural gas, bitumen residue, municipal solid waste (MSW) or biomass into liquid fuels (BGTL). Expander’s patented (#CA 2731376 & CA#2751615) process creates an ultra-clean burning, high performance, zero sulfur, near zero aromatics diesel and jet fuel. Firstly, the natural gas needs reforming. A proven thermal reforming technology is used whereby natural gas reacts with oxygen and steam over a catalyst to produce syngas – a gas comprised mainly of hydrogen and carbon monoxide (other sources of carbon can be converted into syngas through other means, such as gasification). Secondly, the syngas is converted into longer-chain hydrocarbons though the F-T process. The syngas is fed into a traditional tube-based reactor where it is converted into the paraffinic hydrocarbon. While the key to the process is the catalyst, a substance that facilitates a chemical reaction without becoming consumed by that reaction, the Expander EFT® process can use any proven catalyst commercially available and may be upgraded if the technology improves. Thirdly, the waxy hydrocarbon stream is sent for product upgrading and if necessary separation into synthetic diesel and other components. EFT® process then recycles non-economic products back into syngas. This process maximizes carbon utilization of the feedstock, significantly increasing production of higher-value diesel and jet fuel. Expander’s trademark products SynDiesel® and SynJet™ fuels consist of paraffinic hydrocarbons of a significantly higher quality than traditional petroleum based diesel. EFT® fuels are complementary to existing conventional diesel fuels, are considered a “drop-in” fuel and can be used as either straight run fuel or a blendstock. EFT® fuels are ultra clean burning, low in NOx, SOx and particulate emissions, contain zero sulfur and minimal aromatics, and have a cetane rating of >70 (compared to 45-55 rating for most traditional diesels), are biodegradable, have good cold flow characteristics and have reduced GHG emissions compared to standard diesel. EFT® fuels can be used in modern diesel engines without modification reducing engine noise, motor wear and exhaust emissions. GTL and BGTL plants are ideally suited for either physically or economically stranded gas reserves. Natural gas is considered the most efficient and environmentally friendly of the 3 main fossil fuels (others: coal and traditional crude oil). Expander’s plants can provide greater profits at economic production rates of 300 – 20,000 bbls/day and can be situated adjacent to, or replace existing traditional gas plants at a grass roots level. Expander’s EFT® technology offers an alternative use for abundant low cost natural gas reserves – with a finished product of higher quality and of greater monetary value. Expanders EFT® fuels can be railed, trucked or pipelined to any traditional blender or refinery location through existing transport infrastructure. The Fischer-Tropsch (F-T) process was invented in the early 1900’s by Franz Fischer and Hans Tropsch studying the conversion of coal-derived syngas, a mixture of carbon monoxide and hydrogen, into useful compounds such as diesel and gasoline. The F-T process began commercial production in Germany in 1936 to change coal into gasoline as a substitute fuel to run vehicles and airplanes. F-T fuel provided 9% of German war production fuels and 25% of their automotive fuel. F-T fuels have been produced commercially in South Africa since the 1950’s. To date in excess of 2 Billion barrels of synthetic fuel has been produced worldwide. Tsinghua University (Beijing, China), the Desert Research Institute (DRI) (Reno, Nevada), and Greyrock Energy, Inc. (Sacramento, California), announced the results of a research program to evaluate potential improvement in Beijing’s air quality from the use of premium, clean synthetic fuels, such as those produced by Greyrock. The study focused on providing immediate improvements in air quality without the need for changes in fueling infrastructure or the vehicle fleet.